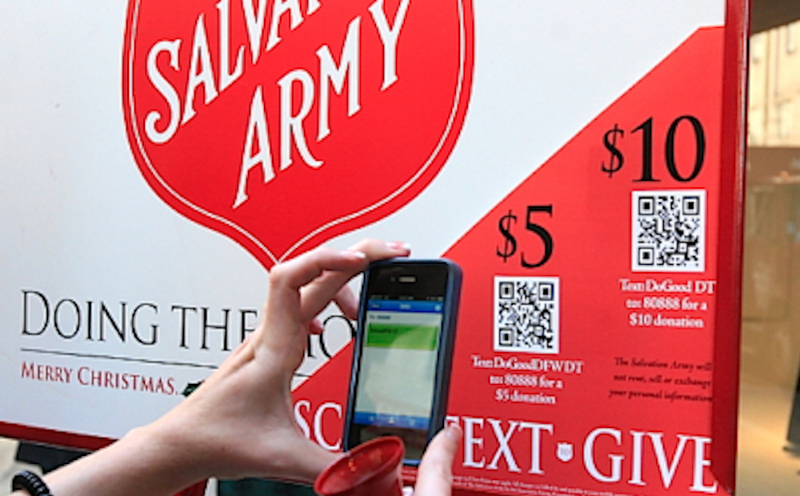 Are QR Codes The Salvation Army’s Digital Salvation? Pull any list of “top 10 Christmas carols” from the web, and it will quickly become obvious that bells are deeply important to people during the holiday season. The odds are good that 30 to 40 percent of the entries on that list will either be about or reference them in some way: “Jingle Bells,” “Silver Bells,” “Carol of the Bells” and “I Heard The Bells On Christmas Day” are the four that come up the most. But the most famous and recognizable Christmas bells heard throughout the annual celebration of peace on Earth and goodwill toward men aren’t referenced all that often in song. It’s from The Salvation Army and its battalion of red kettle bell ringers who have been a fixture of the season for the last 127 years. This Red Kettle Campaign, which sees volunteers standing and ringing next to bright red kettles set up in front of grocery stores and other highly trafficked areas throughout the holiday season raises about $150 million annually – funds that support 30 million or so Americans in need, raised largely through donations of spare change and loose bills, cash that shoppers can easily drop into the buckets while on their commerce journey. The problem in 2018 is that customers are not less generous than they’ve been in years past – Facebook alone raised $125 million on Giving Tuesday – but they are far less likely to be carrying cash. Customers without cash don’t have spare change or loose bills to offer – and, according to some bell ringers, it is affecting donations negatively. The drop-off has pushed The Salvation Army into the digital age, and toward mobile solutions for customers who want to donate, but don’t have a dollar to put into the kettle. In some ways, it’s a challenge that is forcing the organization back to its roots. According to The Salvation Army, the Red Kettle Campaign can be traced back to one inventive man who pioneered the idea In December of 1891: Captain Joseph McFee. Stationed in San Francisco, he had an idea to feed Christmas dinner to 1,000 people in need, but faced a major stumbling block: He had absolutely no money with which to do it. The idea worked, and through his early experiment in crowdfunding, McFee raised enough money to put on the dinner. Because the idea worked, it spread – first throughout the West Coast, where Christmas kettles caught on quickly, and then in the East after McFee was stationed in Boston (at which point they added the bells). The red kettles and their attendant bell ringers weren’t novel for long: They have been effective for 127 years, as McFee’s improvisation to fund a single dinner spread nationwide and, eventually, globally. Today, The Salvation Army’s target is for bell ringers to raise about $30 an hour during the season – a target that in the more modern, digital age have become harder to hit. While obituaries for cash in the U.S. economy get written an awful lot, it is far from accurate to say that cash is dead in the U.S. According to the PYMNTS Global Cash Index, the U.S. used a little over $2.3 trillion in cash in 2015. Twenty-four percent of U.S. citizens make all their purchases with cash, and a third report preferring to use cash for purchases of $10 or less. As of 2018, cash continues to be the most-used payment method in the U.S., with consumers choosing it over debit or credit cards for day-to-day purchases. But though cash is far from dead, its hold is slipping. Cash made up 12.6 percent of the nation’s GDP in 2016, but by 2021 it will represent 11.2 percent. And that change in habits is becoming apparent to The Salvation Army bell ringers, who are finding it harder in recent years to make that $30 hourly target, as they are increasingly running into consumers with no cash to donate. “There are a lot of people who walk by and say ‘you know, I don’t carry cash anymore.’ It’s a problem for us, that’s for sure,” Salvation Army Ringer Charles Fowler told a Maine CBS affiliate. In the past, The Salvation Army experimented with putting credit card readers alongside the red kettles, but found that usage was low and caused more confusion than served a useful purpose. This year, the red kettle brigade is experimenting with QR codes to reach customers who want to donate, but aren’t carrying cash. By snapping a picture of the code with their smartphone camera, the consumer is taken to the donation page of The Salvation Army website, where they can donate directly. So far, according to various national reports, usage hasn’t been high, though they are seeing increased curiosity about the codes, and other ways to donate. And whether The Salvation Army converts passersby to QR givers or remain mostly in the cash collection game, they’ll be out there for the rest of the season ringing a bell to remind people that there are a lot of ways to give to those in need – the important part is to pick one and get the giving done.